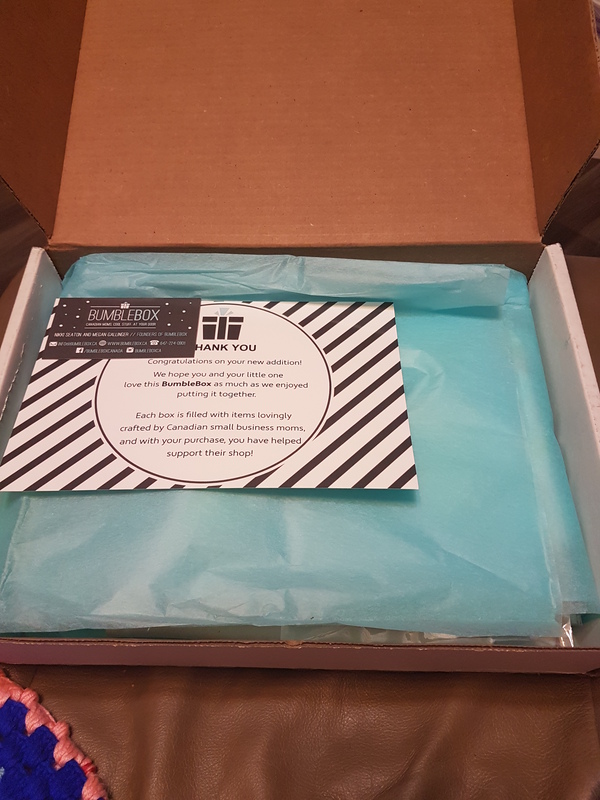 I have received the Bumble Box for 6-9 months. The last box was a little off with the pricing so lets see how this one does. I paid $229.50CAD for three boxes (prepaid). Each box costs $84.99CAD. We have a wet/dry bag. It is not very big; it can fit one or two suckies or a teether. The print is cute and I like to bright yellows on it. I stand corrected these are actually snack bags. Which I find much more useful for their size. This is by MD Handmade (you can find them on Facebook). The Etsy store is set to a way and I could not find a set price. I found a a couple different ones. We will say $5.00CAD. ** I did like this. It was not huge. Unfortunately it ruined in the wash after a couple of times. I cannot say that the bag was poorly made, I think I may have made a mistake the last time I had washed it. 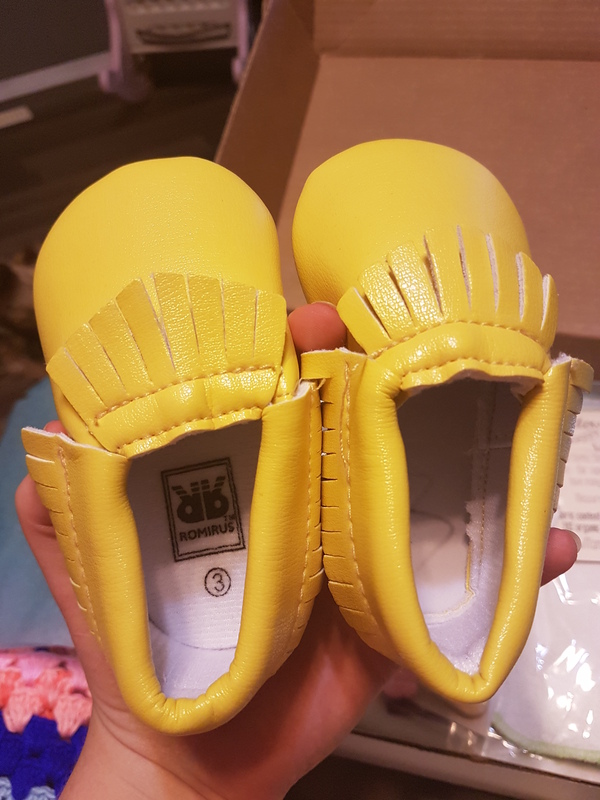 Lemon yellow slippers by Romirus in size 3. As you can see in the second picture there is an insole missing. I can fix this myself but not what I was expecting to see. Now it just might be me but I cannot seem to find their website. I do however see this brand is for sale everywhere. Including on Chinese websites that we regularly shop from. This makes me even more disappointed in a missing insole. I cannot say if this is a Canadian company or even choose a price for them. My hype was moms helping moms when it came to this box. This product does not really seem to fit that. Please correct me if I am wrong though. 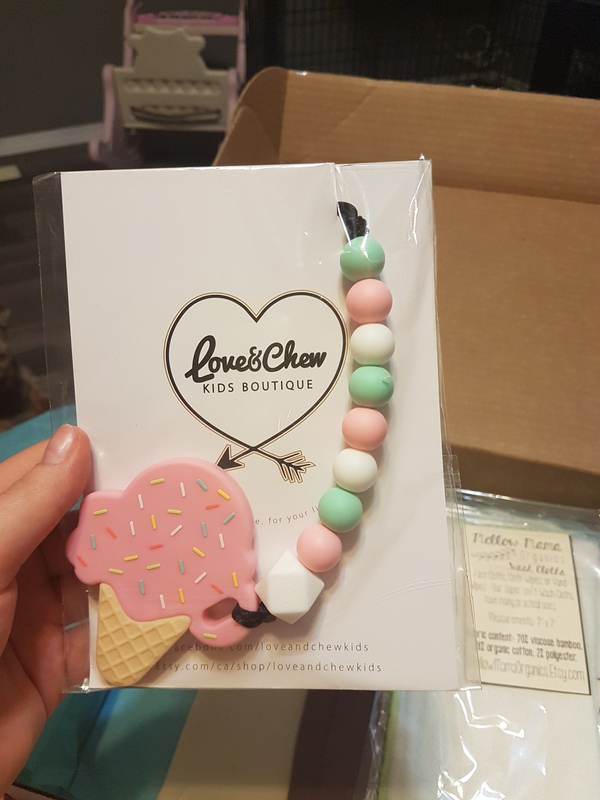 Ice cream teether by Love & Chew Kids Boutique. Now I could not find this exact one in her store I they are all priced at $25.89CAD. I also say a very cute teether with a rainbow cloud on it. I think I may be purchasing it. **Very nice teether and it made me sad Missy was just not a teether baby. She loved playing with it in general though. I think it would have still been in like new condition now had she used it. Now I had these in the last box. 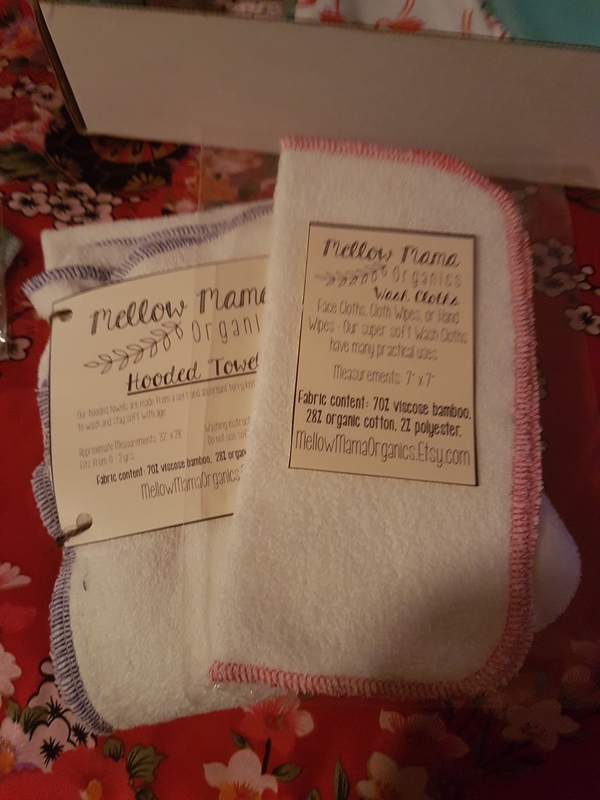 These wash clothes are by Mellow Mama Organics. These clothes come in packages of 8 for $10.00CAD making each cloth $1.25CAD. We have a total of $3.75CAD. I will be using these in a gift basket at the beginning of next year. 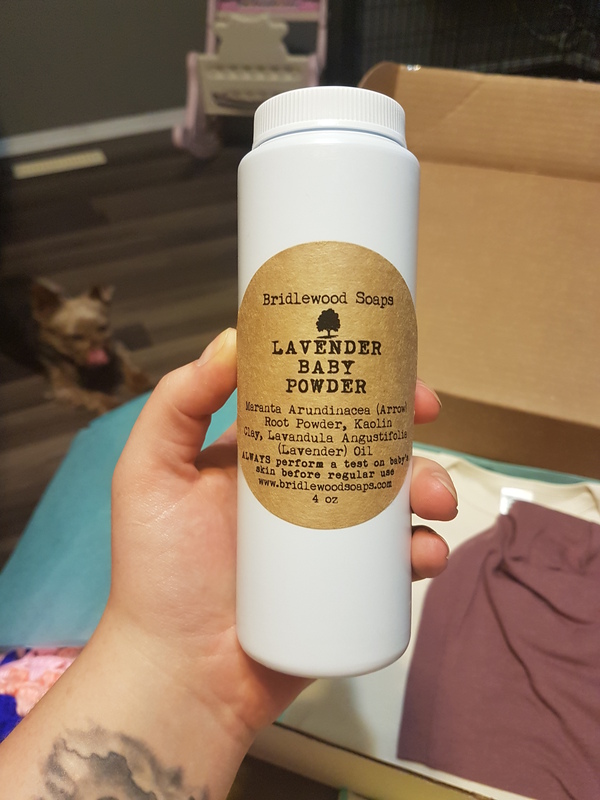 Lavender baby powder by Brindlewood Soaps. This is talc free and made with arrowroot powder. It smells pretty good too. It retails for $14.99CAD on their website. I am not sure if this will be something that we use. Missy has not had to much of a problem when it comes to diaper rashes. I am also not sure about its shelf life either. Besides I have a tried and true system when it does happen on occasion. **Missy has terrible rashes from teether. I have used this and there has been no reaction. I do not see a big cloud when I pour it on her (not shake since we do not want it in the air for us to breathe in). The smell I cannot even find once it is outside of the bottle. 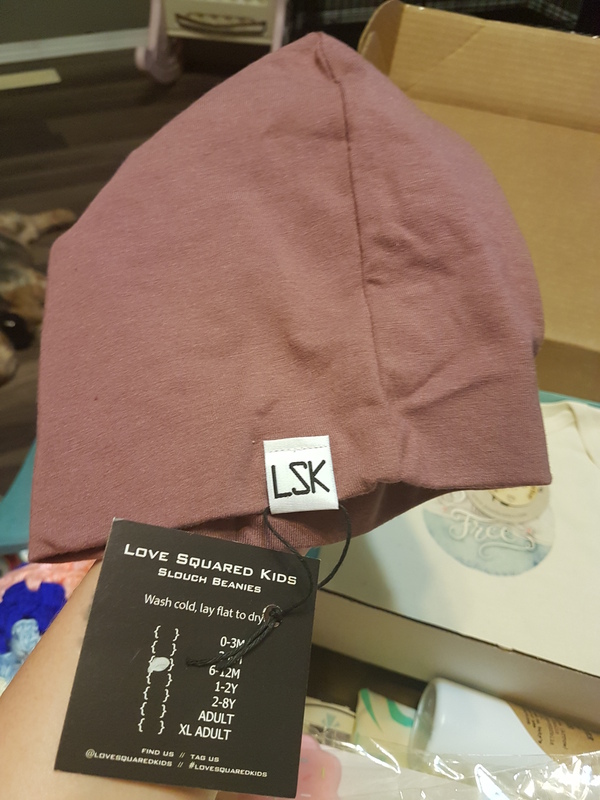 A slouchy beanie by Love Squared Kids. I really like this colour. I know it is just a basic brown but still. They retail for $15.00CAD on their website. **This hat is beautiful! I think it is adorable on her and I live in Canada. Hats are a must in the winter. It is in great condition still too. 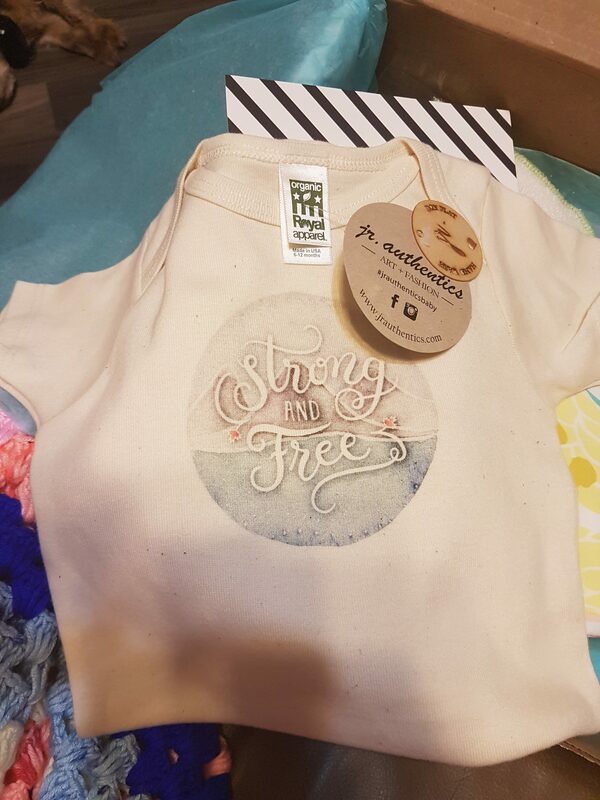 ‘Strong and Free’ onesie byuth JR Athentics. This is made from organic cotton and regular retail is $28.00CAD on their website. **Only got to use this a few times. The cotton was crazy soft. I thought it was cute every time she did wear it. It is a baby onsie though. They kind of all are cute. The onesie and slouchy beanie will look adorable together! So, the same as last time I want to see what we have for value vs what was paid. This time around we have a total of $92.63CAD not including the shoes since I was not sure what price to use. The value is here this time and I am really happy to see that. Everyone has off times and I hope to see value in the next box. Here is another quarterly subscription. This one follows along with your child though. I had thought about getting it when Missy was a newborn but I did not and I kind of wish I did. I paid $229.50CAD for three boxes (prepaid). Each box costs $84.99. Not going to lie the price is a little high but lets see what I got in the first box. 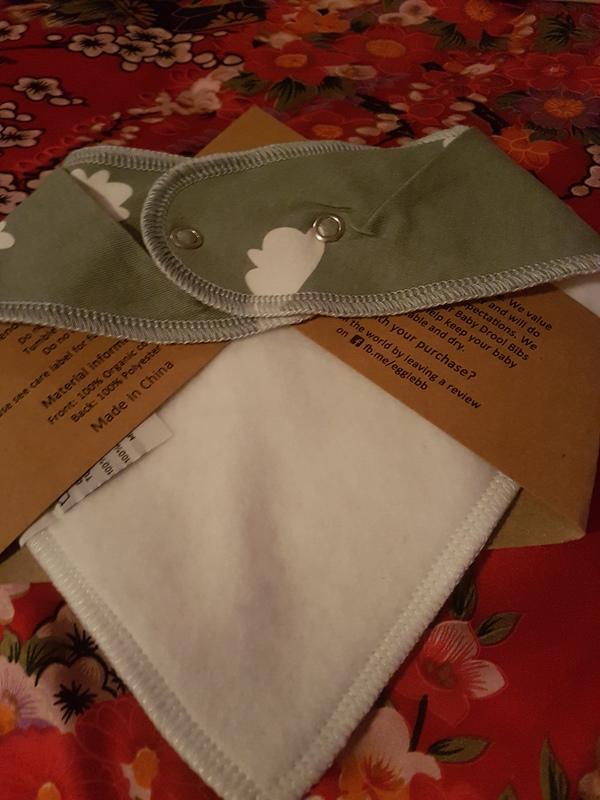 The first item we have is what I am hoping is a very absorbent bandanna bib. Very ‘gender-neutral’ but the print is cute. The backing is very soft and I think Missy is going to love this once I get it washed. 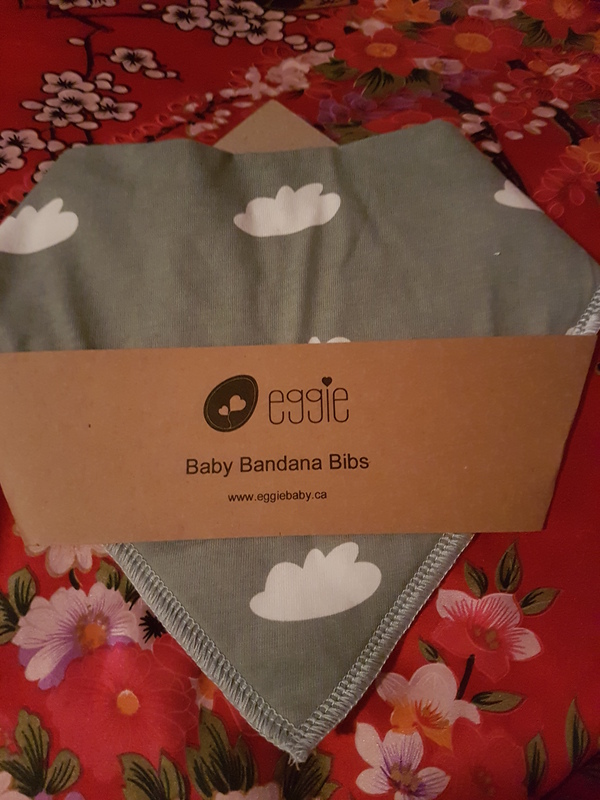 The brand is ‘eggie’ and they are $10.00CAD on their website. This is freakin’ adorable! 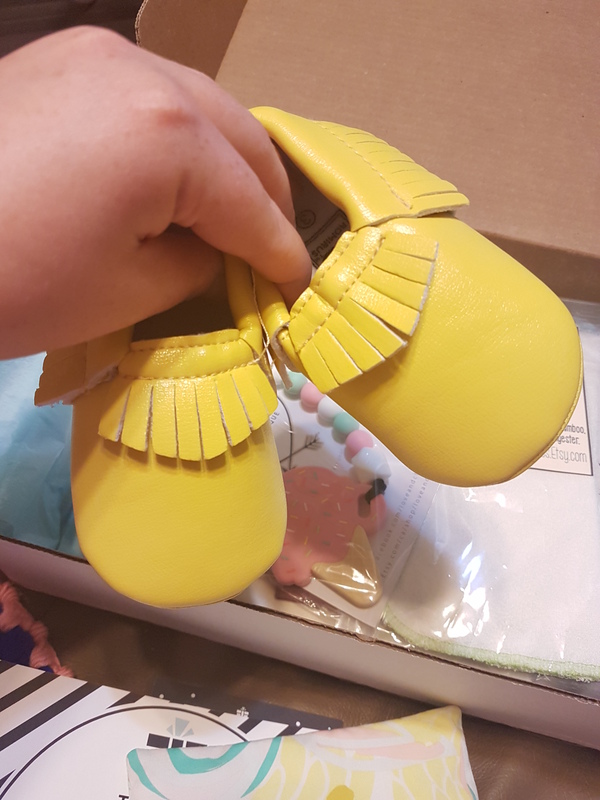 It is by Granny and Mummy Baby Boutique and they sell for $5.50CAD. The band is soft and stretches quite a bit. We have not tried this on yet because she is a wild child and would end up around her face. **We still use this now that Missy is 14 months. She was not in to things are her head when we first got it. She still pulls it off but enjoys it more. I think it is cute. 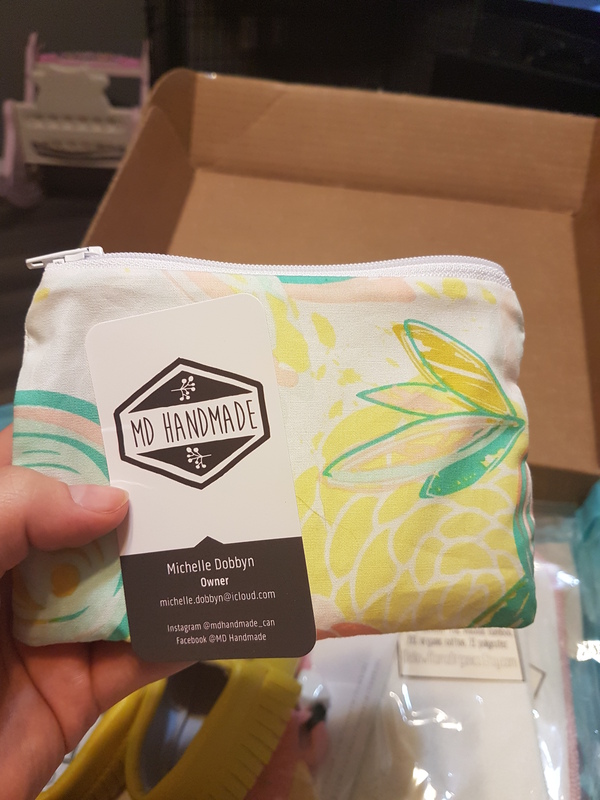 Mellow Mama Organics has their store on Etsy. I have a wash cloth and towel here. 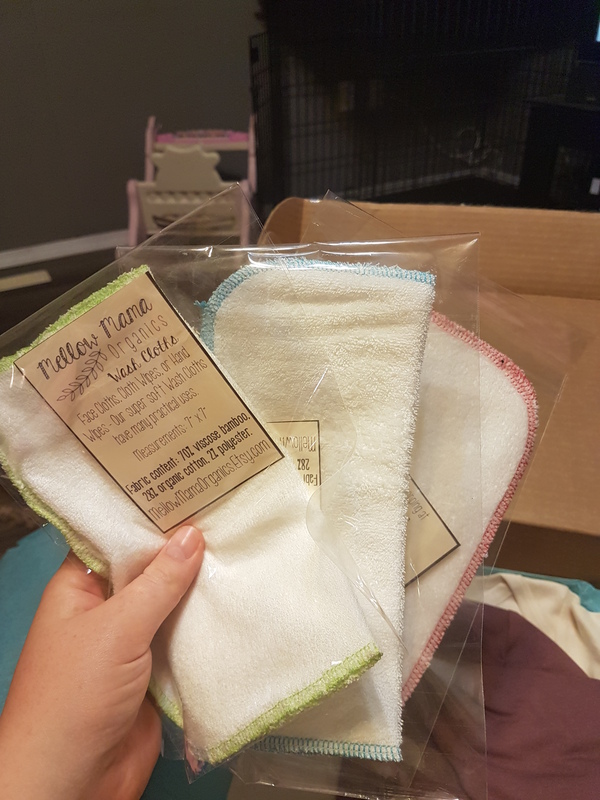 They are very much soft and as much as I want to use them I think I am going to donate them. I have plenty of towels and clothes, I would like to see someone who can not afford items such as these get to use them. So the clothes come in packs of 8 for $10.00CAD which makes one cloth $1.25CAD. The towel sells for $18.00CAD. I may have purchased the wash clothes for myself but there is no way I would have paid that for a towel. I am going to keep this shop in mind though for shower gifts. So we did rig this so that I would be able to use it one evening. 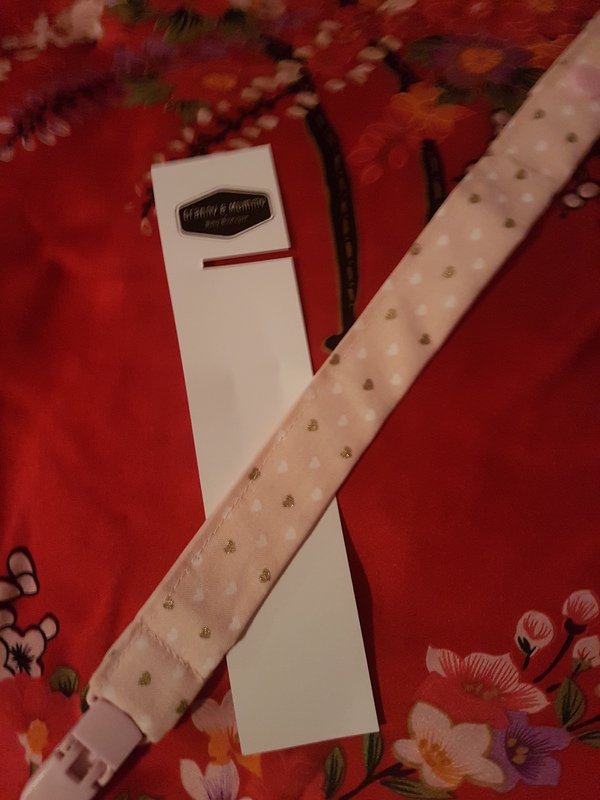 It is a suckie clip by Granny and Mummy Baby Boutique. They sell for $7.00CAD online. None of Missy’s suckies have rings on them so right now it just is not working for us. Although it is very cute. **Still using this at 14 months when we got out. Missy is allowed her sucky at nap/sleep and when we go out. Last but not least. These made the entire box worth it. Are these not the cutest pants ever? I wish I had these in adult leggings! 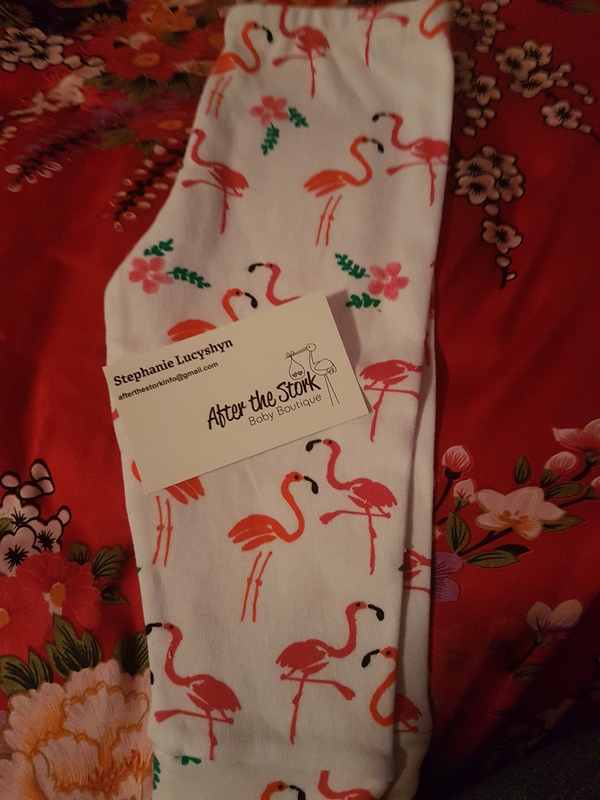 Here is another Etsy shop called After the Stork Baby Boutique. These sell for $24.00CAD. I only checked out her shop quickly but she has other very cute prints but there are some gorgeous bibs on there. The total of this box comes to $65.75…. I cannot say I am that impressed with how that worked out. There are two more boxes to come and I really hope they make up for this. I could have purchased the full pack of wash cloths from Mello Mama Organics and it still would have been cheaper. I will say I did not check out what the shipping would have been but still. I will update the products as we try them out or what I have done with them. I have to wash a couple things before we use it anyways. 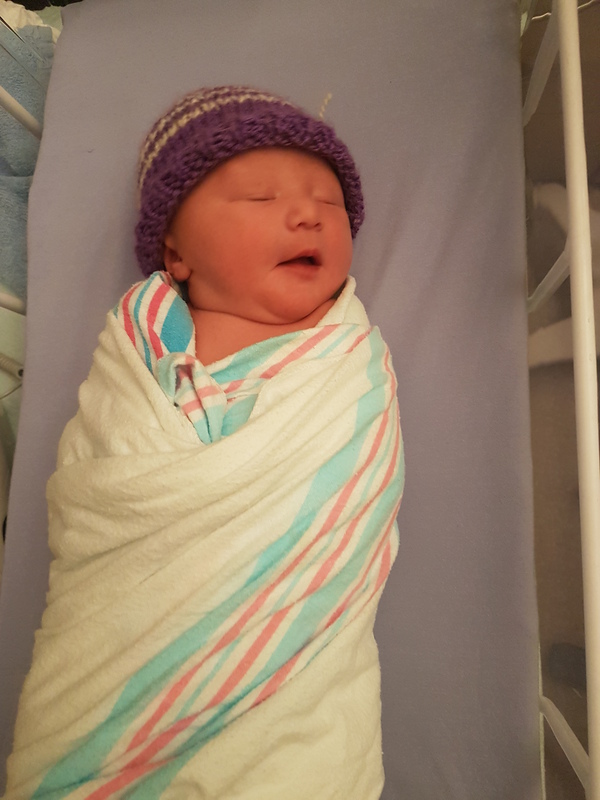 I have been saying there is a reason why we did some things, why I have not been posting much (no promises that will change to quickly), and now I can finally share! We have been expecting a little one and I was pretty much completely drained of energy the entire time. We got a beautiful baby girl for the holidays! Missy did not give us much notice either before entering the world. It is not a long story but a lot happened in such a little time. Don’t forget to like us on Facebook at Chocolate Milks Cows! P.S. I do not plan on turning this into a full time mommy blog but we must remember Missy is the super star of my life now!